I decided to use it in a salad of mixed greens, mushrooms, red pepper, cherry tomatoes, sliced apple, walnut bits and craisins, sprinkled with flaxseed meal. And, of course, no salad of mine would be complete without Annie's Naturals Organic Papaya Poppy Seed dressing on top. I'm soooooooo addicted to this dressing--it's AWESOME! I liked this recipe a lot; truly yummy! And, it smelled GREAT the entire time I was cooking it. :) The recipe says vegans can substitute maple syrup instead of honey; I'm definitely up for giving that version a try, too, especially if it'll turn out as yummy as this. 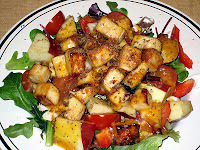 Have plenty of Honey Fried Tofu left over... will have to think of another way to use it this week--other than a salad! Oh, I think I saw this recipe over at VB recently. Looks good! Well, I'm not sure what I'd use instead of the honey, but it still looks mighty tasty!